From the first few notes, it sounds like the real thing. Piano and bass riff hard. Percussion enters. ¡Oiga Papa! Listen up! The trombones come in thick and strong. Fantasia, the first song on Quarter Street’s self-titled LP is authentic ‘salsa dura’ from the old school. Hard salsa. It’s not shiny, it’s not clean and poppy or unduly jazzy. It’s tough, it’s gritty and ballsy, and in terms of musicianship, writing and production, it straight up cooks. Sergio Botero’s voice is pure street Salsero, a worthy inheritor of the tradition defined by Hector Lavoe and Rubén Blades. Conguero Luis Poblete, and brothers Cesar and Cristian Saavedra on baby bass and timbales round out the core Quarter Street. Like many Latinoamerican migrants to Australia, their parents fled the various coups and revolutions of the 70s and 80s, raising their children to the sounds of the Spanish language superstars of the era. Cuban brass virtuoso Lazaro Numa, recently arrived in Melbourne, adds a taste of Havana to the underlying mix of classic Puerto Rico / New York styles. The boys grew up salsa and now they’ve brought an impressive unit of Melbourne’s finest Latin musicians to light up turntables and dancefloors worldwide. 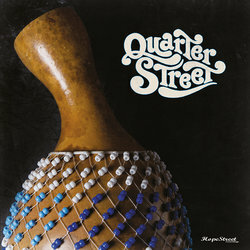 This catchy cha cha was penned in Melbourne by Marcelo Salvo and features Andrew James on piano and shows Quarter Street's diverse range of styles and influences.